Faculty Meeting News and Notes: April 4, 2019 | The Gettysburgian. The faculty began — but did not finish — a discussion on the proposed dual major in business Thursday afternoon. The plan calls for the major beginning during the 2020-21 academic year. The major would be capped at 60 students who would be selected based on academic performance. Provost Chris Zappe anticipates a need to hire two additional tenure-track faculty members and some part-time support to get the program off the ground. Interim Vice President of Development Betsy Diehl anticipates being able to raise money to support the program if the faculty approves it. Faculty discussion probed potential issues of enrollment management, financial viability, and curricular focus. The faculty will continue discussion of the proposal at its next meeting, at which point it could take a vote. The Gettysburg College faculty spent its entire meeting discussing a proposal from the Management Department to add a dual major in business to the college’s curriculum after the visible absence of a quorum led President Janet Morgan Riggs to skip agenda items requiring a vote. As it turned out, discussion of the major consumed the entire hour-long meeting, and not all faculty who wished to speak were able to do so. The plan calls for the addition of the major beginning in the 2020-21 academic year and capping the number of students in the program at 60 per class year. The major would include seven core courses, six of which are currently requirements of the business minor, three elective courses from other departments across campus, a capstone experience, and a “critical action-learning” component that could be fulfilled by an internship, studying abroad, or a community engagement experience. Students would be required to declare the major at the end of the first semester of their sophomore year, and the top 60 students based on academic performance who apply would be accepted. At the time of applying, students would have to provide a formal academic plan and rationale of how they intend to integrate business and their primary major. Dr. Heather Odle-Dusseau, Chair of the Management Department, and Bennett Bruce, Lecturer and Pre-Business Advisor, presented the proposal, which comes on the heels of numerous discussions at faculty meetings and elsewhere about an impending shift in the demographics of students attending college that could threaten the college’s financial standing. The Faculty Finance Committee, led by Professor and Chair of Economics John Cadigan, has projected financial deficits if the college does not do more to increase revenue and curtail costs as the college’s discount rate, the percentage of tuition not received due to financial aid, continues to climb. Against that backdrop, the Management Department developed the proposal in consultation with the Provost’s Office and with feedback from the Academic Program and Policy Committee. At the meeting, Odle-Dusseau and Bruce emphasized the desire for strong interdisciplinary connections within the major and noted that 24 course proposals had been submitted after a call for proposals was released in February that offered $2,000 to faculty members who develop courses that would meet the requirements of the major. 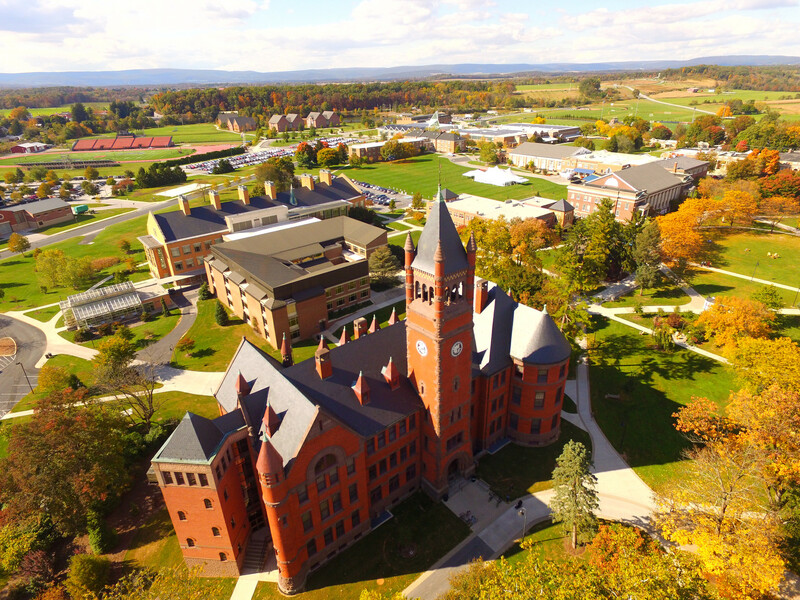 “We really wanted to stay true to what Gettysburg College is and what it means — the prestige associated with the Gettysburg College and how we could carry that into a potential offering in a business major,” Odle-Dusseau said. She added that the current Organization & Management Studies major encompasses a small part of the broader sphere of business such that it would be disingenuous to merely rename the department business in an attempt simply to attract students looking to study business. Director of Admissions Gail Sweezey observed that, over the past several years, she has seen a marked shift in what prospective students are interested in studying. 15 years ago, she said, the weakest college-bound students were the ones who wanted to study business but that now, it is high school valedictorians and other strong applicants — including high numbers of first-generation and international students — who want to study business. Because Gettysburg College offers only a minor right now, Sweezey said, it can be challenging to recruit those students. A total of 13 faculty members rose to ask questions or make comments after the formal presentation concluded, and at least three more were awaiting recognition when Riggs adjourned the meeting shortly after 5:00 p.m. Chair of Classics and Former Dean of Academic Advising Gail-Ann Rickert questioned why students would be required to declare the major at the end of the fall semester of their sophomore year, which is a semester earlier than the general deadline. Capping the number of students at 60 and requiring the earlier declaration, Rickert said, “will require a lot of hand-holding” for students. Chair of Art & Art History Felicia Else suggested that providing students more time to declare would allow for “more dynamic” pairings. Professor of Economics and Chair of Public Policy Char Weise, who preceded Odle-Dusseau as Chair of the Management Department, said that while he is “sympathetic” to the concept of a business major, that department is already stretched too thin and that the college’s finances are limited such that he would not be inclined to approve a new major of this magnitude without external funding and the guarantee of new faculty positions. Provost Chris Zappe responded that he projects the need for two additional tenure-track faculty members in the department as well as several part-time sections. In terms of financing, Interim Vice President of Development Betsy Diehl said that her office has identified 2,000 living alumni who were business administration majors, of which 40 percent could have the financial capacity to donate at a significant level. She added that she has spoken to families and members of the Board of Trustees who have expressed interest in financially supporting a new program of this nature. “No promises, but I think it’s hopeful,” she said. Numerous faculty members raised questions about the timing and process for moving forward as well as about the college’s history with the business curriculum. Cadigan, the Faculty Finance Chair, said that, in his view, the prospect of a business major is “pretty simple.” If the college could enroll 10 additional students per year thanks to adding the major, by the fourth year, there would be at least $1.2 million in additional annual revenue, which would more than cover the cost of faculty to support the entire program. From the perspective of APPC, Chair and Professor of Psychology Brian Meier said that his committee was not comfortable co-sponsoring the motion because the process was rushed and Faculty Finance was not able to weigh in ahead of the meeting. While he believes the members of APPC are generally supportive, he recommended pursuing a more systematic process and revisiting the plan next year. Associate Professor of Music Avner Dorman recalled from his previous service on APPC shortly after he arrived at the college in 2010 that the potential addition of a business major could have affected the college’s classification from the Carnegie Commission on Higher Education, which determines in which category the college is ranked by organizations such as US News & World Report. Specifically, he worried the addition of a pre-professional major like this could jeopardize the college’s liberal arts designation. Riggs responded that the college’s subclassification could change from arts & sciences to arts, sciences & professions if more than 20 percent of its degrees would be awarded in professional areas. That category is occupied presently by Washington & Lee, Bucknell, and Lafayette. This would not, however, affect the college’s category for national rankings, Director of Institutional Analysis Suhua Dong said, even though her projections show that adding 60 new business majors per class would move the college to 23 percent of degrees being conferred in professional areas. That analysis notwithstanding, Associate Professor of History & Chair of Africana Studies Abou Bamba expressed concern about the college’s continued drift away from a traditional liberal arts focus. “It seems to me, at least, that more and more we are moving towards a vocational school as we pile up these new majors that are more towards a professional track,” he said. In closing, Lecturer and Entrepreneur-in-Residence Drew Murphy, who teaches many courses in the current business minor, which he helped develop, expressed his full-throated support for the proposal to add a business major. He said that, each year, he teaches about 230 students who come from at least 17 majors in finance courses. In his view, the major would be best if it were called something other than just “business,” but he recognizes the marketing value of the stand-alone name. The faculty has only one more regular business meeting this academic year, which is on Thursday, April 18. At that meeting, they could vote on the proposal.